After the credits roll, the game will save and you'll end up back home. Go downstairs. Mom tells you Professor Sycamore wants to meet you at Lumiose Station. When you go outside, Shauna will offer to trade you her starter Pokemon for ANY of your Pokemon. 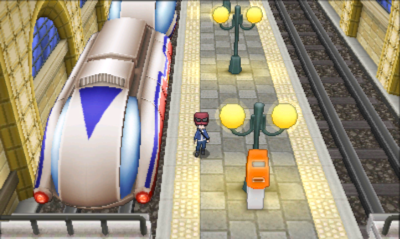 Fly to North Lumiose City and head east to get to Lumiose Station. 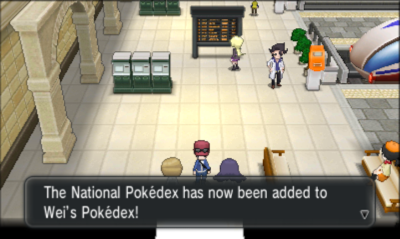 Once inside, Professor Sycamore's assistants will give you the National Pokedex, which unlocks all the Pokemon! Talk to Professor Sycamore and he'll give you a TMV Pass to Kiloude City. Take the train to get to Kiloude City. Head over to the Pokemon Lab. Talk to the scientist on the second floor to get a Poke Radar, which allows you to find hidden Pokemon in grasses. Go to Cafe Soleil down the street to trade any of your Pokemon for a Ralts with an attached Gardevoirite from Diantha. Take the train to Kiloude City. To do so, scan your pass at the orange machines in front of the trains. Once you get to Kiloude Station and go outside, an old man will give you the Vs. Recorder, which you can use for recording battles. 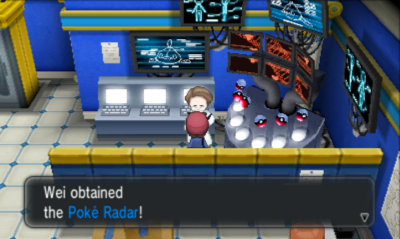 Inside the Pokemon Center, a man known as the Judge can assess where your Pokemon has the strongest Pokemon. Talk to the little girl in the next house down to get TM91 Flash Cannon. In the house northwest of the Pokemon Center, the guy inside will ask you for a bunch of advice and battle you. 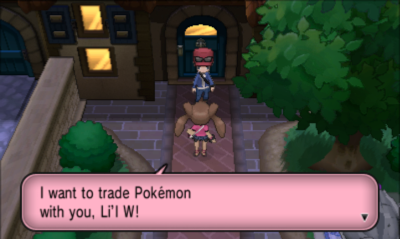 East of that house is the Battle Maison, where you can battle to earn Battle Points that you can then trade for prizes. East of that, pick up the Nugget on the ground. Go inside the house in the northwestern corner of Kiloude City. Talk to the girl sitting at the table for TM58 Sky Drop. All the way east is the Friend Safari, where you can catch a different set of Pokemon for each friend you have. Pick up the hidden PP Up right outside. After having at least one battle in the Battle Maison, go to the park north of the city to challenge your rival Serena to a battle. After defeating her, she'll give you an Absolite. Following Serena's instructions, fly to Anistar City to meet up with Professor Sycamore by the sundial. Your Mega Ring will be upgraded to allow you to find Mega Stones hidden throughout Kalos. Now that you've defeated the Champion, you can catch Mewtwo! Fly to Snowbelle City, head south through Route 20 and Pokemon Village, and go inside the Unknown Dungeon. You'll see Mewtwo just standing there. Mewtwo is at Lv. 70 and quite difficult to catch. If you're thinking about using your Master Ball, now's the time. 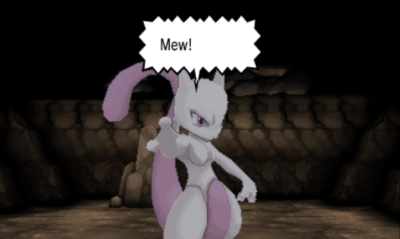 After catching Mewtwo, you'll also get a Mewtwonite X so you can Mega Evolve Mewtwo during battle. From Anistar City, head south to Terminus Cave. Following our guide, go deep inside past the previously blocked area. Here, you can pick up a Lustrous Orb, Griseous Orb, and Adamant Orb. Of course, you came all the way here to catch Zygarde. Zygarde is at Lv. 70 and pretty tough to catch. Good luck!